We had hummus. We had some amazing grass-fed lamb shoulder from our meat CSA that I’d two-day-marinated in olive oil, garlic, cumin, red onion and crushed red pepper. We had red onion, tomato, cucumber and lettuce. The only thing we didn’t have was pita. So, because I reeaaaallly did not feel like going to the store, Week 4’s project decided itself. I checked out recipes from James Beard’s Beard on Bread and Paul Hollywood’s 100 Great Breads (prompting The Husband to ask, as he walked through the kitchen, who the f#%* Paul Hollywood was? ), but even with those venerable sources, I was pretty sure the pitas wouldn’t puff; I figured we’d be rolling the lamb up in flatbreads rather than stuffing it into pita pockets. 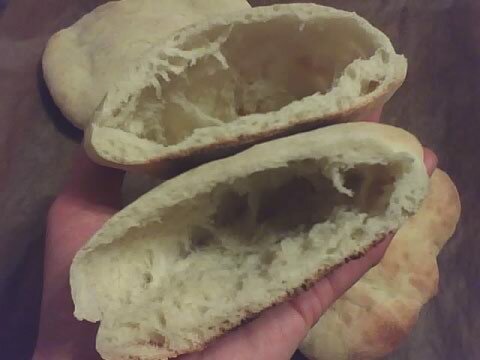 The Husband chided me for my pessimism then went back to googling Paul Hollywood; I started the pita dough. In a medium bowl, whisk together 4 cups flour, 1 tablespoon salt, 1/4 cup sugar, and 2.5 teaspoons active dry yeast (or one envelope), then stir in 1 1/4 cup warm water and 1/4 cup extra-virgin olive oil. Turn out onto a lightly floured board and knead until the dough is no longer sticky, about three to five minutes. Mist the bowl with non-stick cooking spray, return the dough to the bowl, cover with plastic wrap, and let rise for an hour. Line two baking sheets with foil or parchment, place them in the oven, and preheat to 500 degrees. Take the time to let your oven get really, really hot for this recipe. If your oven, like mine, doesn’t heat evenly, you might want to bake these one sheet at a time. The ones at the back of my oven got much puffier than those in the front. Or you could set up your oven with quarry tiles a la Uptown Oven. Don’t bake the pitas (pites, actually, but I thought you’d think it was a typo) longer than five minutes. If you do, the bottom half will be distractingly crunchy. (You can see, in the photo, how toasty mine got on the bottom.) Still delicious, but there’s a time and a place for pita chips. This is neither that time nor that place. I tried this. Gave it the ol’ cabbage try. They did not puff. Mine did not puff. Why didn’t they puff? You lied. And the worst part is that now I’m not badass. I’m still, however, coming to cheese class on Monday. Liars are the worst! I’m sorry the pitas didn’t puff. I’m not going to do anything obnoxious, like quote the directions/suggestions back to you and ask if you followed them, but next time (I hope there’ll be a next time?) maybe let the dough rest a bit longer, both before and after shaping. Maybe that’ll help with the aeration situation. Did you just eat them like naan or flatbread? Gosh, I hope the mozzarella will mozz on Monday night. Otherwise, I’ll be in deep trubs. I just ate them as food, and they served fine for that purpose. They seemed to rise enough. I don’t know if I let too much heat out of the oven while putting them in or what. Might I have kneaded too long? My smoke alarm went off. That was a first. I’m sure the mozzarella will mozz on Monday. As long as you, not I, make it.